A map of Beleriand, The Place which many of the events of the silmarillion take place. This map is made primarily form two different sources, one of which of course is the map of beleriand found in the silmarillion. However, I did use a secondary source for the Lands North of Anfuaglith, which of course aren't included in the map from the silmarillion. 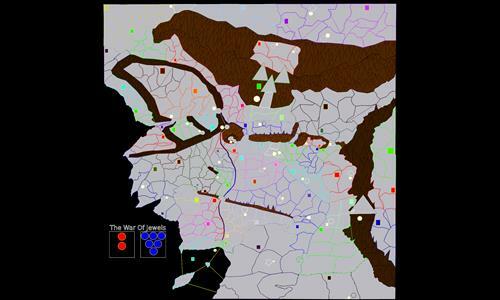 This source was karen-wynn fonstads map of beleriand, which does include angband and a portion of Dor Daedelos. I decided that angband was such a crucial place in beleriand that it wouldn't be a very good decision to exculde it. However, becuase of this, None of the regions north of Anfauglith should be considered Canonical, even in the strict sense of karen-wynn fonsatds work. The reason for this is because I only adopted the shape of the Land from the atlas of middle earth. The borders of everything in dor daedelos(with the obvious excepetion of Angband) were just made up by me. Everything south of anfuaglith is canonical though. Review by Nathan on 6/11/2014. Incredible map! So many maps of Middle Earth could use the terrain far more effectively - this one really does so. The scale is grand and the battles are glorious. My only substantive (as opposed to aesthetic) comment is that the northern wastelands should probably connect down to Angband and/or eastern Ard-Galen, just even things out a bit. Cosmetically, some of the borders make it hard to see how territories connect. Also, Woods (4) in the Beleriand Coast probably should not connect to Plains (13) in the West Beleriand Plains. Finally, I would love to see each territory receive a unique name - so many are called something like "Hills (1)" or "Marshes (3)". Still - a fantastic job! Review by David Robert Hastings Ruiz on 9/25/2015. Barad Khazad! Khazad Aimenu! Excelent map, faithfully recreates the setting of the Silmarillion and of the early legends of Middle Earth. Review by Timothy Rosini on 12/11/2015. Big Silmarillion fan here, this was a joy to play. Maybe tries to encompass a bit much but nonetheless I thoroughly appreciate the meticulous detail and time that went into creating this map. Thank you. Review by Jiror on 6/11/2014. Since this is a pretty major screw up, I've fixed this and submitted a new version right away :) Hopefully you weren't too pissed off and you can find it in your heart to give me another chance(This is my first map).